On October 31, 1517, the seeds of a future society based on freedom of conscience are planted. The Protestant Reformation began in Germany in the year 1517 through the influence of Martin Luther. The Reformation was a product of the Renaissance. One great feature of the Renaissance was the revival of ancient learning and its emphasis on original intent. Original documents can become corrupted with the passage of time through poor translation and lack of respect for original context, Renaissance men tried to clear up those corruptions by restoring the originals. The Reformation was a movement to clear up corruptions in religious matters in order to restore the Bible’s original intent. Luther was a Catholic Priest who became convinced that certain practices and beliefs of his Church were corruptions that crept in over time. 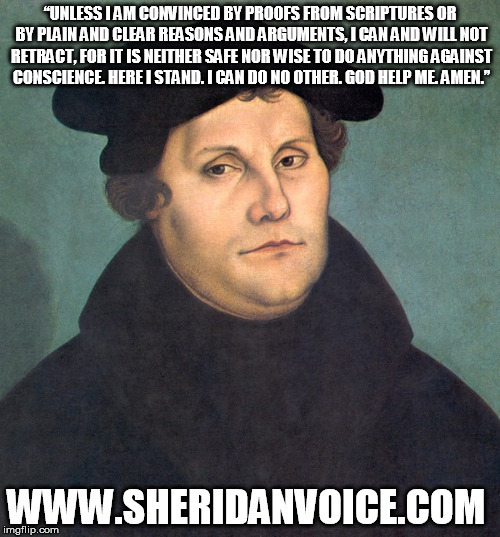 He put his concerns, his “95 Theses,” in writing and posted them on the door of the Wittenberg Church, on October 31, 1517, intending to spark a debate among Church leaders. Contrary to his wishes, however, the theses were translated and dispersed among the common people causing a great stir! In those days church and state were intimately connected; church doctrine was enforced by the state. The king, nobles, and clergy ran everything, while the common people, who were in the majority, were oppressed. It was a top-down fixed system. Luther didn’t want to leave or destroy his church, he wanted to reform it. But the rulers of the reigning Church-State system didn’t want reform, they wanted, like all stubborn or corrupt power does, the status quo. The Pope expelled Luther on January 3, 1521, for his writings. 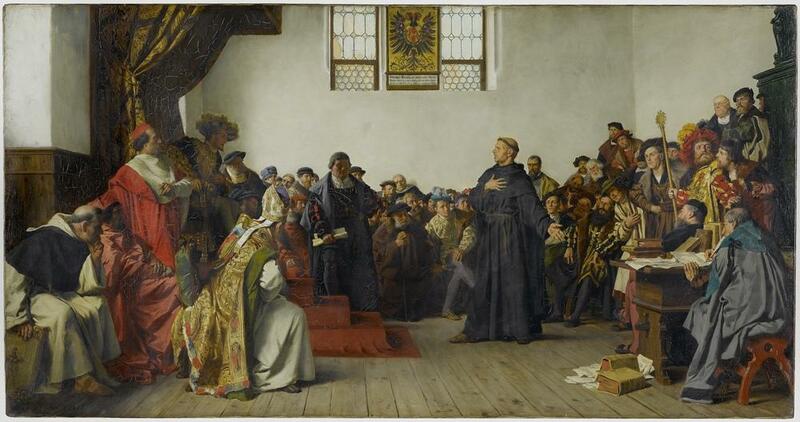 Three months later, on April 17th, Luther was summoned to either renounce or reaffirm his beliefs at the Diet of Worms, which had been in session since January 28. When Luther stood before the august crowd consisting of the religious hierarchy, nobles and the king, he was presented with a table covered with copies of his writings and was asked if was willing to recant their teachings. Luther requested time to think about his answer. Granted an extension, Luther prayed, consulted with friends, and then presented himself before the Diet the next day. This statement was the seed of a future society based on liberty of conscience! It marked a turning point in European History. By respectfully declaring that the Church had no authority to enforce a belief, Luther was not only challenging the Church but the Civil Government as well. Luther wasn’t asking for much, he would gladly and joyfully admit he was wrong. He simply pleaded with the leaders to convince him of his errors through persuasion and reason, not force. The hierarchy wasn’t interested in reason, however, only force. Then, on May 25, 1521, the Diet of Worms ends when Charles V, Holy Roman Emperor, issues the Edict of Worms declaring Martin Luther an outlaw. Luther and his followers dispensed with many practices they felt were contrary to the original intent of Scripture. Luther held that the individual approaches God directly through Jesus Christ without the need of any human intermediary. Thus, in the spirit of the Renaissance, the individual was emerging from the massive, top-down, hierarchical, corporate religious structure. The Reformation didn’t bring total religious freedom at that time, but it was a step in that direction, a huge step! Original intent, individual dignity and responsibility, and freedom of conscience are the principles which emerged out of the Reformation. Europeans brought these ideals to the American Colonies, shaped them to their American experience, and slowly improved them over time. Americans, of all colors and creeds, are now guaranteed complete liberty of conscience and individual rights, We are also sticklers when it comes to original intent when interpreting and applying our Constitution, our laws, and even our Bibles. In America, tyrannical overlords, both political and religious, were ousted over time as slavery and enforced religion have been abolished.